The Professional Interior Designers Institute of Manitoba is committed to enhancing the practice of Interior Design in Manitoba, and to educating the public about the benefits of Interior Design. As a professional body, its aim is to improve quality of life, and protect the health, safety and welfare of the public through the design of the interior environment. This past week members of The PIDIM would have received an email from Construction Specifications Canada - Winnipeg Chapter with probably one of the best Specifications written regarding an Addendum. In case anyone was not on that email list - The PIDIM has included the Addendum below. 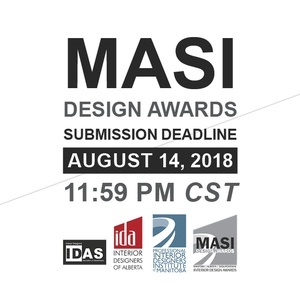 The PIDIM along with the Interior Designers of Alberta (IDA) and the Interior Design Association of Saskatchewan (IDAS) invite you to participate in the 2018 MASI Design Awards. Winning entries will be announced at an awards ceremony event on October 18, 2018 to be held in Saskatchewan and will be featured on the PIDIM, IDA and IDAS social networks. Additionally all prices noted above are for construction costs only and should not include furniture, fixtures or consultant fees. Projects must be a minimum of 3 areas (ie not only a reception or a kitchen area). Ten years ago when PIDIM Council created the Manitoba Design Exposition, I don't think anyone envisioned that the show would become the event that it is today. Our original vision to give back to the Resource Community and provide a venue where the design community - Industry and Design Professionals alike can come together has grown exponentially each year. That first year with 55 Exhibitors seems so long ago and with the decision this year to expand the exhibition floor to the South Centennial Ballroom at the Victoria Inn and Conference Center will provide space for up to 120 Exhibitors!! For over a decade, Western Living magazine, Canada’s largest regional homes and design magazine, has celebrated the best and brightest in Western Canadian design with its Designers of the Year Awards. Mandatory building energy labelling is coming. What should we be doing to prepare? Improving building energy performance is a key part of addressing climate change. The federal government has identified building energy labelling as a way to make building energy performance more visible and to move the market toward efficiency. They have signalled a move to make such labelling mandatory. Some provinces and cities are already taking this on. Edmonton is one of the cities. They are leading the way with their Building Energy Benchmarking Program for big buildings and their Residential Labelling Program for homes. Mike Mellross is a Program Manager in the Energy Transition Unit of the City of Edmonton. He will tell us about Edmonton’s experience and plans for the future. He will also provide insight into the directions this is taking across the country and what we should expect to see coming our way. Location: Manitoba Hydro, 360 Portage Ave.